With our managed Hosted Exchange service you all of the functionality of a dedicated Exchange server, backed by Thexyz support team for a fixed, monthly cost. As a Microsoft Certified partner, our strong relationship with Microsoft gives us premier access to new hotfixes and product updates. Our Microsoft Certified Technicians, help you every step of the way, allowing you to know your mail is in the hands of email experts. Our hybrid deployment of Exchange allows users to easily upgrade to Exchange from our Premium Webmail offering, you can even mix and match Webmail accounts with Exchange on the multiple domain email accounts. A full copy of Outlook 2013 or Outlook 2016 for PC and Mac is included to allow for full synchronization and client access on desktop, mobile and web. Company data is sensitive and if an employee phone is lost or stolen, you need to be able to wipe the mobile devices and restore email data, calendar and contacts with minimal disruption. Add DLP policies based on regulatory standards for mailbox servers, including PII and PCI. Now included with Hosted Exchange at Thexyz. Use a dial-in number to join Skype meetings from any device, dial out to bring participants into the meeting. Allows for unlimited meetings per month no matter where your participants are. Create documents with style; polish work with others easily and enjoy a new reading experience on modern devices. Reach up to 10,000 attendees for very large meetings. Attendees can join from virtually any web based browser and device. Record Skype for Business meetings, including audio, video and shared content, and store and publish in OneDrive for Business or other locations. Anywhere access with all your communications and collaboration in one place. Active directory data is accessible and searchable in real time 24X7. Thexyz Email Archiving keeps a record of all transactions, examinations, reports and information held in email messages. Leveraging a reconciliation with Thexyz Email and Exchange Server 2016, all conveyances are caught, reproduced and archived securely, permitting administrators to search and recover information from any archived representative mailbox by date, names, information, and key words in messages and connections. Rapidly and effectively recoup lost or erased messages and connections, secure years of association transactions and correspondences. Copy messages from users mailboxes without having to manually download pst files. Simply check the email archiving upgrade box on the order form to enable email archiving for your domain. Preserve every inbound and outbound email and file attachment in the secure and dynamically scalable archive. All incoming and outgoing email with be backed up to an additional portal with unlimited archiving storage. 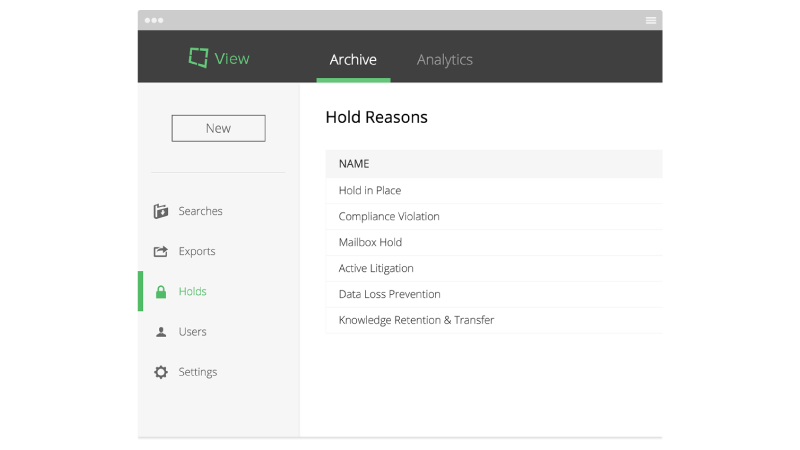 No longer will users need to manage an archiving folder as email archiving works without any user action needed. Rapidly and effectively recoup lost or erased messages and connections from the recoverable items folder. Secure years of association transactions and correspondences with an auto expanding archiving solution. It is possible to recover deleted items for 14 days only if the Exchange online archiving upgrade is not enabled. With the archive feature enabled, an unlimited amount of incoming and outgoing email will be archived. Any deleted mailbox can be fully restores with all contents from the time of terminiation. There is no software to install or hardware to maintain. Each new release of Microsoft Exchange comes with improved capabilities to enhance business communications and productivity. But it also requires having increased specialization in managing the platform. When considering any on-premise email solution, the following areas must be optimized to ensure that the system is robust, secure, and able to offer users the functionalities and end-to-end availability they need to work productively. What level of performance and uptime can be achieved in-house? Are you comfortable with not controlling your maintenance? How robust are your infrastructure and security policies? Our Microsoft Exchange hosting and Outlook® were made for each other. 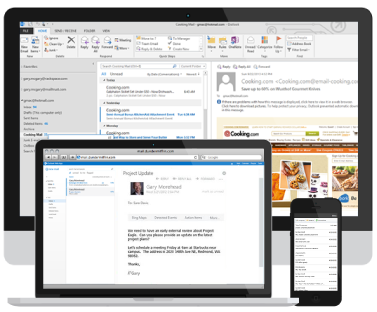 Realize the power of Exchange with all the features and functionality of Outlook from your desktop. Not using Outlook? Access via desktop through emClient Thunderbird®, Mac® Mail, or any other POP or IMAP desktop and ActiveSync compatible software. The familiar look and feel of Outlook, from any computer. Outlook Web App lets users log in and manage email, calendars, contacts, and tasks from any web browser, with instant updates. Get seamless access and integration to email on all devices with an included license to Outlook 2016 on the desktop and web access on mobile and web via the mobile responsive Outlook Web App. There is also an iOS app that allows you to access your account through the app. What is Hosted Exchange 2016? Microsoft Exchange Server is the most widely-used business email hosting system in North America. It is the preferred email platform for more than 185 million people around the world. Businesses use Exchange for email, calendaring, contact synchronization, task management, address lists, accessing shared document repositories, mobility and much more. Will Hosted Microsoft Exchange work on my Mac? Yes. 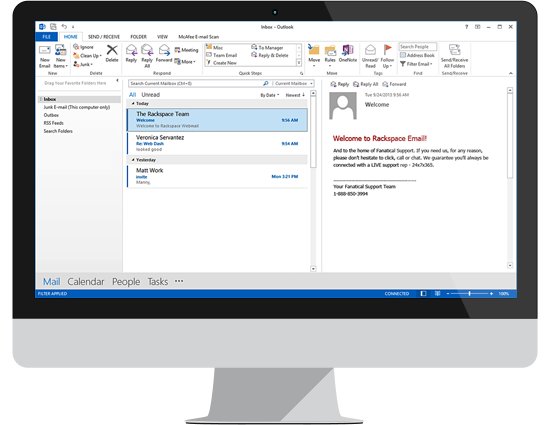 Microsoft Outlook 2016 for the Mac is available for download in our control panel. It integrates seamlessly with Thexyz Hosted Microsoft Exchange. The amount of storage available with our Hosted Exchange will depend on which version of exchange you have. For Exchange 2010 the storage is 50MB. For customers on an Exchange 2013 and 2016 environment, the maximum mailbox storage is 100GB. Outlook Web Access or OWA is a way to access your email online from any computer. This can be useful if you’re not at home or in the office where email is usually checked through an exchange client. To access your email online, log in through Thexyz Webmail. How do I add an admin to my account? Log in to the Email Administrators Control Panel and on the right hand side under My Account select Manage Administrators. Now select Add Administrator and fill out the information on the next page. Can I upgrade from a previous version of Exchange? Absolutely. Our internal email migrations team performs migrations from Exchange Server 2007, Exchange Server 2010, Exchange Server 2013 and 2016. You can see this page for more on our email migration service to the latest version of Exchange. Can I upgrade to hosted Exchange from your Premium Webmail product? Yes. We provide a seamless migration of your existing email data on any of our other email services. Email migrations to Exchange are undertaken by our in house migration experts. Because these are undertaken internally and the mailbox name usually remains the same, there is a short period that you will lose access to your email. Once it has fully migrated, you will be able to login and access your account until. No email will be missed or lost during the migration. This kind of email migration has no cost so you do not need to order through our migrations page, simply open a ticket and we will reply with a migration plan.